A large crowd gathered at the Georgetown Magistrates’ Courts in anticipation of the arrival of former Finance Minister, Dr. Ashni Singh and Ex-Chief Executive Officer (CEO) of the National Industrial and Commercial Investments Limited (NICIL), Winston Brassington. Singh and Brassington were charged jointly for misconduct in public office. The charges were brought against them, some three weeks ago by the Special Organised Crime Unit, (SOCU). Shortly after 13:00hrs today, Singh and Brassington walked into the courthouse accompanied by a battery of lawyers, including former Attorney General, Anil Nandlall, Stanley Moore, Ronald Burch-Smith, Mark Waldron, Sase Gunraj, Priya Manickhand, Marcia Nadir -Sharma and Euclin Gomes. The duo headed straight to the Chief Magistrate Courtroom as supporters of the previous PPP/C regime swarmed the Court House in show of support for the accused. While in the courtroom, the men were also greeted by a group of supporters before Chief Magistrate Ann McLennan could exit her Chambers and read the charges of Misconduct in Public Office to them. They were charged after SOCU completed its Pradoville Two investigation. 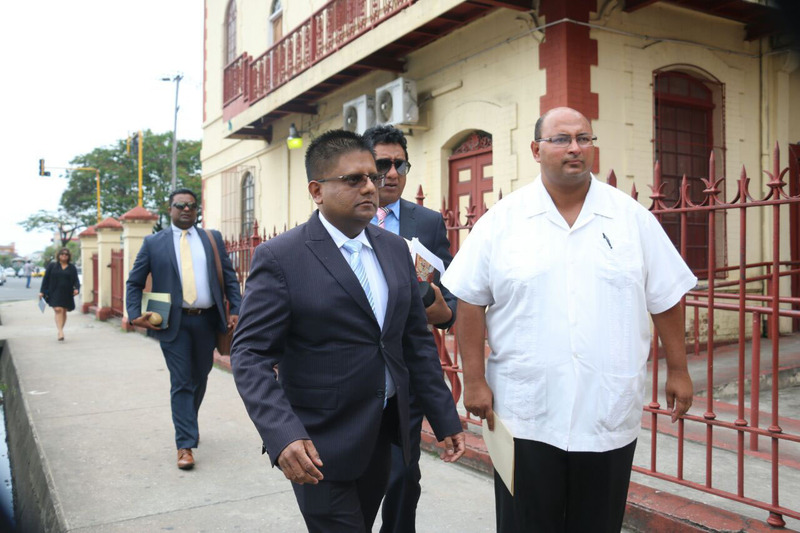 The first charge alleged that Dr. Ashni Singh, being and performing duties of Minister of Finance, and Chairman of NICIL, a company owned by the Government of Guyana; and Brassington, being and performing duties as the Chief Executive of NICIL, on May 14, 2011 at Lot 126 Barrack Street, Kingston, Georgetown, sold a tract of land being 10.002 acres of Plantation Turkeyen, East Coast of Demerara, property of the State for the sum of $185,037,000, without first having procured a valuation of the said property from a competent valuation officer. It is further alleged that Dr. Singh, and Brassington on December 30, 2008 at Lot 126 Barrack Street, Kingston, Georgetown, by way of Agreement of Sale and Purchase without due diligence, sold to Scady Business Corporation, a 4.7 acres tract portion of Plantation Liliendaal, East Coast Demerara, for $150M knowing that the said property was valued at $340M by Rodrigues Architects Associate, a competent valuation officer. The last allegation against the two stated that Dr. Singh, and Brassington on December 28, 2009 at 126 Barrack Street, Kingston, Georgetown, by way of Agreement of Sale and Purchase, acted recklessly when they sold to National Hardware Guyana Limited, a plot of state land at Plantation Liliendaal, ECD, being 103 acres for the sum of $598,659,398 (VAT exclusive) without first having procured a valuation of the said property from a competent valuation officer. They were not required to plead to the charges. Nandlall who spoke on the behalf of the accused asked the Court that his clients be released on self bail. However SOCU Prosecutor, Trenton Lake told the court that bail should be granted to the accused but in a substantial amount. He noted that the accused have sufficient means of finance and will be able to post bail. Prosecutor, Trenton Lake added that the investigation is still ongoing and more charges are likely to be laid against the two men. They were both granted bail to the tune of $6M each. This amount did not sit well with Nandlall. The two men were then sent through the prisoners chute and into the court lock-up. Dr. Singh and Brassington are expected to make their next court appearance on June 5. They are likely to face more charges. Speaking to the press after posting bail, Dr. Singh said that he is not fearful. He said that he knows that his over 20 years of service to Guyana can withstand scrutiny.